Well not nearly as cold as advertised - around 15 C 60 F - very nice change to the winter weather up island. 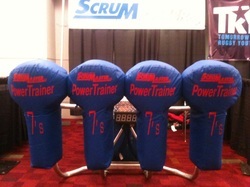 Arrived in one piece - and set up the latest build of ScrumMaster art - to feature our 7s line of gear - The PowerTrainer Series. Met with a lot of keen coaches who are building new 7s programs in High School - primarily becuase of the Olympic focus. This is certainly happening in Canada as well - though not to the same level of intensity. I think the American attitude when it comes to an Olympic sport is almost a bit frantic in terms of wanting to rule the roost as quickly as possible. With our well thought out line of equipment - schools who were not even considering a rugby program a few years ago are going the 7s route - and it looks like this will be the start of an interesting few years of development in the US school system. Doing some out side coaching - using our equipment - hope to have some pics and vid later on Sunday. _Headed to Atlanta, Georgia this morning via Seattle to attend the national High School Athletic Director's conference. Showing off our ContacTrainer - and our new Accustat™ Gauge to rugby coaches from around the US. It will be good to catch up with Ric Suggitt - former Canadian team sevens and fifteens coach - who is now having a lot of success with the USA women's team. He is presenting some coaching theory along with USA Rugby CEO Nigel Melville. Heard it is cold in Georgia - but likely not like we have been experiencing at ScrumMaster world HQ in Malahat. Power went out after midnight last night - which meant packing for this trip via flashlight. We will hopefully send some video of coaches and players hitting the machine - and for sure some pictures. After this - off to Hong Kong to visit a customer and do some service upgrades to the machine owned by the Hong Kong RFC. Then on to Las Vegas where our machine will be on hand to help our Number 1 World Ranked Canadian women's team as they look to extend their unbeaten streak into 2012 after sweeping five tournaments in 2011! They are calling my flight - so talk to you soon! _Here is where we discuss the dark arts of the scrum. We take questions - analyse video - and offer tips on the best way to make your scrum an effective platform within your team. Over thirty years playing rugby and twenty five years building scrum training equipment.